They're making another movie. Seriously. 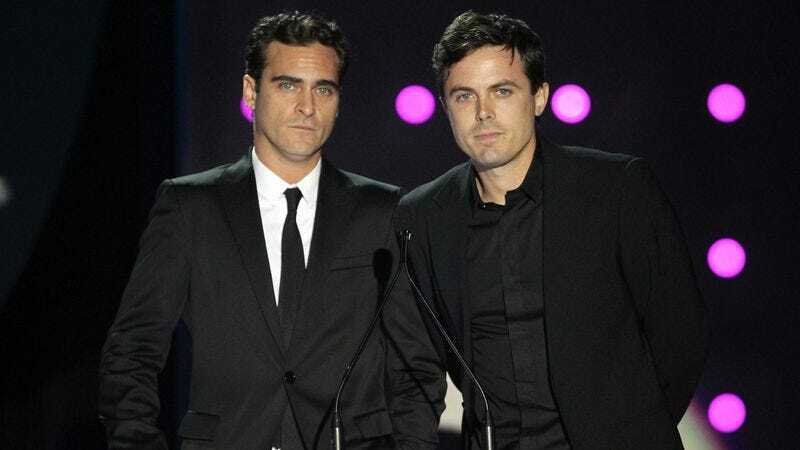 Because it went so well the first time, Casey Affleck and Joaquin Phoenix have decided to try this whole “let’s make a movie together” thing again. According to The Hollywood Reporter, the director and star of I’m Still Here are set to take on those jobs again, this time for a Western period piece entitled Far Bright Star. Ironically, that name also works well as a subtitle for I’m Still Here. Based on the 2009 novel by Robert Olmstead, the screenplay (by Dominion writer Damien Ober) is set in 1916 and tells the story of an aging cavalryman leading a group of young men on the hunt for Mexican revolutionary Pancho Villa. Unfortunately for them, “when the group is attacked and most of his charges are killed, the man is left struggling for survival in the desert.” So, basically a re-telling of what happened to Phoenix and Affleck post-I’m Still Here, only replace “his charges” with “credibility,” and “the man” with “their careers.” They’ve both gone on to do continued great work after that odd entry in their respective filmography, so it’s all faux-Borat water under the ill-conceived bridge at this point. Still, we can’t be entirely sure this period Western isn’t also a put-on, and at some point during filming it will be revealed that our entire society is just window dressing for an enormous performance art piece, possibly aided and abetted by James Franco.